The Siege of Catubig was a long and bloody engagement fought during the Philippine-American War, in which Filipino guerrillas launched a surprise attack against a detachment of U.S. infantry, and then forced them to abandon the town after a four-day siege. It began on April 15, 1900, and lasted four days before the survivors were rescued. The attack was very similar to the Balangiga Massacre south of Catubig a year later. A barangay or baranggay (, formerly referred to as barrio, is the smallest administrative division in the Philippines and is the native Filipino term for a village, district or ward. In metropolitan areas, the term often refers to an inner city neighbourhood, a suburb or a suburban neighborhood. The word barangay originated from balangay, a kind of boat used by a group of Austronesian peoples when they migrated to the Philippines. Poblacion or población is the common term used for the central, downtown, old town or central business district area of a Philippine city or municipality, which may take up the area of a single barangay or multiple barangays. It is sometimes shortened to Pob. San Jose de Buan, officially the Municipality of San Jose de Buan, is a 4th class municipality in the province of Samar, Philippines. According to the 2015 census, it has a population of 7,769 people. 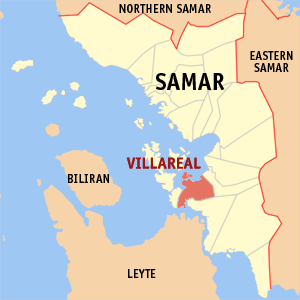 Villareal, officially the Municipality of Villareal, is a 4th class municipality in the province of Samar, Philippines. According to the 2015 census, it has a population of 28,230 people. Bobon, officially the Municipality of Bobon, is a 4th class municipality in the province of Northern Samar, Philippines. According to the 2015 census, it has a population of 23,668 people. Gamay, officially the Municipality of Gamay, is a 4th class municipality in the province of Northern Samar, Philippines. According to the 2015 census, it has a population of 23,511 people. Laoang, officially the Municipality of Laoang, is a 2nd class municipality in the province of Northern Samar, Philippines. According to the 2015 census, it has a population of 61,359 people. Lope de Vega, officially the Municipality of Lope de Vega, is a 4th class municipality in the province of Northern Samar, Philippines. According to the 2015 census, it has a population of 14,687 people. Mapanas is a fifth class municipality in the province of Northern Samar, Philippines. According to the 2015 census, it has a population of 14,025 people. Mondragon, officially the Municipality of Mondragon, is a 3rd class municipality in the province of Northern Samar, Philippines. According to the 2015 census, it has a population of 38,726 people. Palapag, officially the Municipality of Palapag, is a 3rd class municipality in the province of Northern Samar, Philippines. According to the 2015 census, it has a population of 34,286 people. 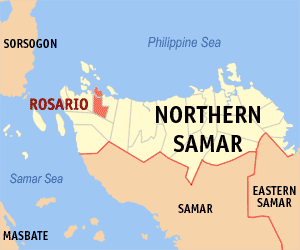 Rosario, officially the Municipality of Rosario, is a 5th class municipality in the province of Northern Samar, Philippines. According to the 2015 census, it has a population of 10,520 people. 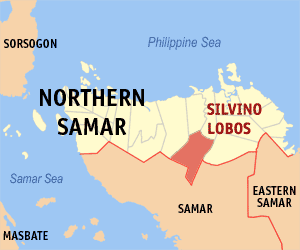 Silvino Lobos, officially the Municipality of Silvino Lobos, is a 4th class municipality in the province of Northern Samar, Philippines. According to the 2015 census, it has a population of 15,299 people. Victoria, officially the Municipality of Victoria, is a 5th class municipality in the province of Northern Samar, Philippines. According to the 2015 census, it has a population of 14,817 people. Arteche,, officially the Municipality of Arteche, is a 3rd class municipality in the province of Eastern Samar, Philippines. According to the 2015 census, it has a population of 16,026 people. 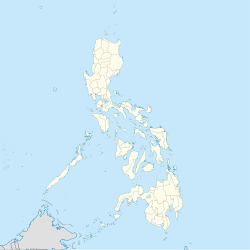 General MacArthur, officially the Municipality of General MacArthur, is a 5th class municipality in the province of Eastern Samar, Philippines. According to the 2015 census, it has a population of 14,550 people. Jipapad, officially the Municipality of Jipapad, is a 5th class municipality in the province of Eastern Samar, Philippines. According to the 2015 census, it has a population of 7,885 people. Llorente, officially the Municipality of Llorente, is a 3rd class municipality in the province of Eastern Samar, Philippines. According to the 2015 census, it has a population of 20,149 people. Mercedes,, officially the Municipality of Mercedes, is a 5th class municipality in the province of Eastern Samar, Philippines. According to the 2015 census, it has a population of 6,070 people. Quinapondan, officially the Municipality of Quinapondan, is a 5th class municipality in the province of Eastern Samar, Philippines. According to the 2015 census, it has a population of 14,779 people. San Policarpo, officially the Municipality of San Policarpo, is a 5th class municipality in the province of Eastern Samar, Philippines. According to the 2015 census, it has a population of 14,687 people. Taft, officially the Municipality of Taft, is a 4th class municipality in the province of Eastern Samar, Philippines. According to the 2015 census, it has a population of 18,915 people. ↑ "Municipality". Quezon City, Philippines: Department of the Interior and Local Government. Retrieved 31 May 2013. 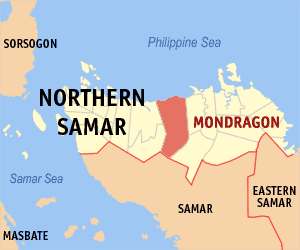 ↑ "Province: Northern Samar". PSGC Interactive. Quezon City, Philippines: Philippine Statistics Authority . Retrieved 12 November 2016. 1 2 3 Census of Population (2015). "Region VIII (Eastern Visayas)". Total Population by Province, City, Municipality and Barangay. PSA . Retrieved 20 June 2016. ↑ Scott, William Henry (1985). Cracks in the parchment curtain and other essays in Philippine history. New Day Publishers. p. 93. ISBN 978-971-10-0073-8. ↑ Census of Population and Housing (2010). "Region VIII (Eastern Visayas)". Total Population by Province, City, Municipality and Barangay. NSO . Retrieved 29 June 2016. ↑ Censuses of Population (1903–2007). "Region VIII (Eastern Visayas)". Table 1. Population Enumerated in Various Censuses by Province/Highly Urbanized City: 1903 to 2007. NSO. 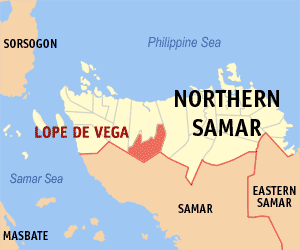 ↑ "Province of Northern Samar". Municipality Population Data. Local Water Utilities Administration Research Division. Retrieved 17 December 2016.